What would be the most difficult of all seasons to photograph? Winter, of course! It seems that more photographs are discarded in the winter than any other season. Why? Because the average tone of a snow-covered landscape is far lighter than a medium gray. So, the photograph of snow often is underexposed. The rule of snow photography is very simple. "Most of your photographs will probably turn out too dark with possibly with a shade of blue, if you let your meter be your guide." There is also an old saying, "If it is bright, add light." Remember, without side lighting, there are no shadows in snow to cause textures. If you photograph snow on an overcast flat day, all you will get is a dull, light-gray photograph... no matter what you do. Photography during the winter is a challenge, even for the most experienced photographer. So, don't get discouraged, keep learning from your mistakes and keep practicing. If you are thinking that it is cold and you would rather be inside with a hot chocolate, snoozing in front of a warm fireplace, your photographs will reflect that attitude. Get pumped and enjoy the challenge of attacking the wintry conditions outside. Your photographs will display your enthusiasm. This might also be the time to think of "On-The-Go Photography" when you "Travel Light & Travel Simply." Dress comfortably warm and you will enjoy your winter photography experience. Read the "What To Wear And Bring While Snowshoeing" article. The information on what to wear is applicable for winter, even if you are not going to snowshoe. Learn to recognize the signs of hypothermia (where heat is lost from your body faster than you can produce it). You can be affected by hypothermia in milder temperatures (50 degrees) as well as freezing temperatures. Winter brings out photography opportunities that are quite unique and completely different from the rest of the seasons. There are so many unusual and unique designs available from the newly fallen snow and frozen water. Learn also to recognize what photography opportunities might be available based on the type of day that it is. For instance, a sunny day during the winter, might lead to a fast running waterfall over an icy ledge. Always keep your outdoor ears listening for any sounds that might indicate a photography moment. Try keeping your camera as warm as possible as most malfunctions occur due to cold batteries. If you can, keep your camera inside your coat and always use alkaline batteries whenever it is possible. Take along as many extra batteries as you feel you might need based on the temperature. If it is snowing, protect your camera with a zip-lock bag. Cut an opening for the camera lens and viewfinder. If needed, wrap a rubber band around the bag and camera to hold the bag in place. Do not blow the snow off the camera lens as the condensation from your breath might freeze on the lens. Brush all snow off instead. When you are done for the day, place the camera into a small plastic bag to protect from condensation on the camera when it is brought inside. Don't breathe through your nose on the camera's viewfinder when you photograph as you might create some ice on the viewfinder due to condensation. Always tell someone where you will be going and when you expect to return. You may never be in a dangerous situation, but the first time it happens, you will be thankful that someone knows when you where you are. Don't ever be too overconfident with your outdoor ability as a hiker in the winter as it will always come back to haunt you. 1) There seems to be too many gray skies during the winter. Use a graduated filter to color the sky while leaving the foreground natural. 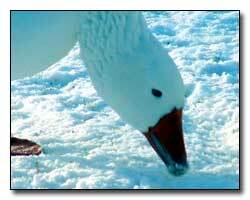 2) When photographing wildlife in snow, the best way to reduce contrast is to use a fill flash. 3) Get prepared the night before and have everything at your fingertips. You become slower in cold weather and it is much harder to do the simplest movement with layers of clothing and gloves. 4) The sunlight during the early morning and late afternoon offers unique photography opportunities due to the reflections and colors. Get an early start and you will be rewarded. 5) Look for the contrasting lines and objects that appear when the snow does not completely cover the landscape. Place yourself in multiple positions to find the most dynamic photograph. Don't forget to add some color to the photograph as it will create a dramatic effect with the white snow. 6) Night photography can be accomplished from the light of the moon. The landscape lights up under the light of the moon and the reflection of the snow. 7) To reduce some sky in the photograph, position yourself at a higher location and look down. 8) Look for the birds. If it is snowing, use a slow shutter speed for the snow to add an interesting effect. Keep in mind, though, that it is a hard combination of wildlife and a slow shutter speed. The snow reflection goes from forty to fifty percent with dirty snow, up to eighty to ninety percent with fresh fallen snow and even higher reflection with wet, fresh fallen snow. 1) If the freshly fallen snow is pure white, meter the pure white area only with spot-metering. There will not be any detail in the snow. Open up 2 stops. And if you still aren't quite sure of what you want, set your shutter speed at increments of 1/2- and take a series of shots. You might even trying bracketing your exposures. There are so many approaches to snow photography, use the method that works the best for you.